In order to help support the efforts of the Mesa Prieta Petroglyph Project financially, we have organized an Adopt A Petroglyph program that gives you and others the opportunity to be a part of our preservation team. We hope you will help us protect rock art for future generations by adopting a petroglyph today. Consider adopting a second petroglyph or more to honor a friend, a child's class or for holiday gifts while supporting a significant preservation effort! 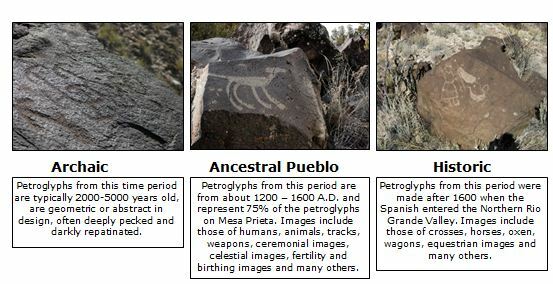 Examples of time periods represented on Mesa Prieta. on the Wells Petroglyph Preserve.